I always crave something sweet right after lunch and used to rush to the nearest store to grab one of those energy balls that are labelled ‘healthy’. But how healthy are they really? Take the Apple & Cinnamon energy balls I used to buy for instance. 2% is the amount of apple that goes in it! Yes, you heard me well! 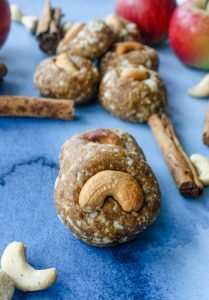 Cashews represent 29% which is good, but then follows a list of ingredients such as whey protein isolate, flavourings, emulsifier and stabiliser, along with other ingredients that are high in sugar. 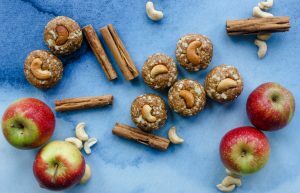 My Apple & Cinnamon energy balls (or mignardises*) have plenty of apples in it, more than 2% I promise 😊 and are full of whole and nutritious ingredients. This recipe is very easy to make and will only take 10 minutes of your day. You will get to enjoy a delicious and nutritious treat every day of the week, with the satisfaction of knowing what goes in it. You can also switch for agave syrup or other sweetener of your choice. Make sure to get gluten-free oats if you are gluten intolerant. The combination of cashew butter and cinnamon taste a little like caramel to me, it goes without saying that this is divine! Plus, cinnamon and apples are made for each other! All you need is 5 ingredients to make this delicious and nutritious Apple & Cinnamon Mignardises. 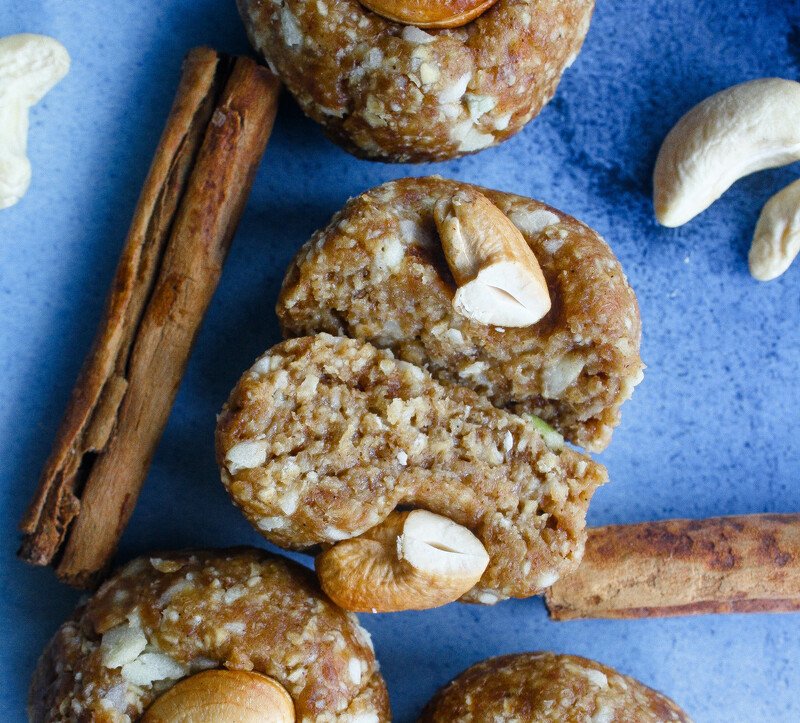 Roll the mixture into small balls, you can hide a little cashew in the centre of each one if desired. Place the Apple & Cinnamon Mignardises into the freezer for 1 hour to set. Oh, elles me rappellent une recette que j’avais réalisée pour un livre de cuisine il y a quelques années. J’avais adoré. Ta version m’a l’air terriblement gourmande tout en étant parfaitement saine, il me tarde de tester!